A Paris luscious dress with a touch of wild! 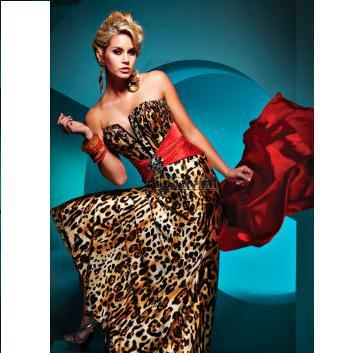 This Leopard print gown has a contrast waist and train. Paris prom dresses and gowns are from famed designer Tony Bowls and are sleek and sophisticated. Animal print charmeuse. Strapless with an illusion panel over a deep notch. Piping adds a corset look with beading scattered across the neckline. Large chunky beading at the waist. Contrast sash with bow and ruffles in back with long detached train. Zip back. Shawl included. Shown in Red / Leopard.